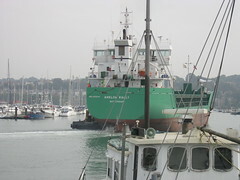 The Arklow Rally dwarfs all the boats on the river as she makes her way up to the scrap metal yard further up the river. You can just see a tug in attendance on her port side there. I wonder how long it will be before we see her sister, the Arklow Raider, up this way? I've made it to the big time, with an article that I wrote for Mad Mariner magazine published today. It's interesting to read my story after what seems to be a considerable amount of editing work. I suspect my original authoring took far less time than the editing for the finished product. I'm not sure that my overall enjoyment of the whole experience, and satisfaction for the things I have achieved came over all that well. Oh and apologies to Robin who didn't get the credit he deserves, I didn't see the completed story until after it was published. All the cutting and welding of the big section of plate below the water line was done by him. 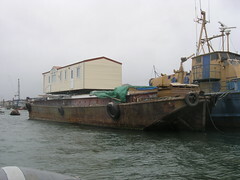 Well it's one way of instantly converting a barge into a floating home, this just a short distance down the river from where Lady Jane is moored. At least this method skips all the messy work below decks, and provides a house on the water with almost no effort at all. Coming out the front door of a morning seems fraught with all kinds of problems though. I must say, this would be ideal for living in while actually doing a conversion. Oh the pleasure of somewhere clean, dry and warm to live while all the dirty work is being done. The forecast for the weekend was not that great, so it was an opportunity to crack on with inside projects. In the event it hardly rained at all, so I feel I wasted a bit of an opportunity to work outside on the hull. Anyway there is no shortage of things to do, inside or out. 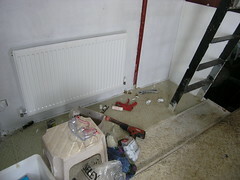 Here you see the progress so far with finishing the insulated wall where I've put the radiator. 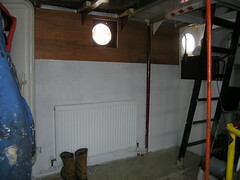 There is still the window frame to go in and the insulated piece of the deckhead (ceiling) to complete. A final lick of paint or two will have this place looking like new. This picture turned out much better than I was expecting. Note the red oxide primer around the edges of the deck there. This is the start of a lick of 'beauty paint' on Lady Jane. The idea being to just slap paint onto Lady Jane, with the minimum of preparation, in the places where it's likely going to be a while before I get around to doing it properly. This way Lady Jane looks a lot better quicker, and helps preserve what is already there to some extent. I know I'll have to rust bust this space properly, at some point, but at least it doesn't look so bad in the meantime. Also John would prefer Lady Jane to look good when he takes her out! The hot water and central heating system is now in and working, though not complete yet (flue rain cowl and more radiators to do). 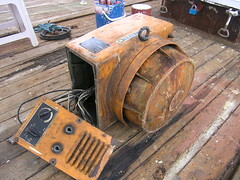 Anyway, with the immediate hot water issues out of the way, attention is now focused back on rust busting the hull. 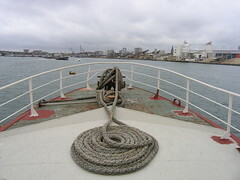 The picture shows progress at the stern. 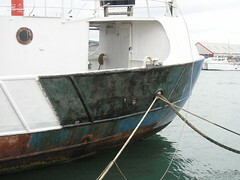 Here you can see that I've rust busted the top section all the way back to the newly painted bit at the stern. The observant amongst you will also note the progress I've made, with Fred's help, getting a coat of white primer a good way towards the stern. So we took a special trip down to Southampton Water, to see the Queen Elizabeth 2 off on her 40th anniversary round Britain cruise. 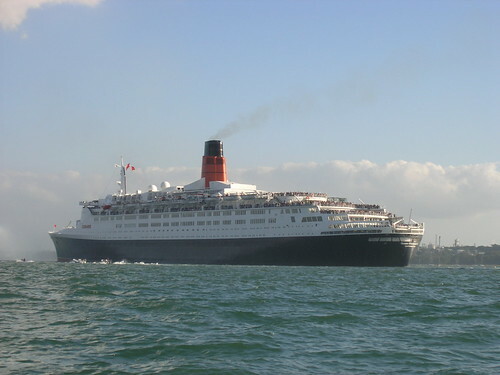 In the picture you can see the spray from the monitors of the tug leading the QE2. Look at all those people on board. Quite some sight to see from way down there in the rib (hbi). 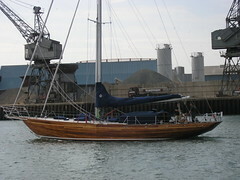 In November next year she will be retired off to Dubai, to become a floating hotel. I bet that last yoyage will have a big send off from Southampton. So connecting up the diesel is the second from last piece of this huge jigsaw puzzle that is the heating system. The brass dome you can see on the diesel line, before the filter, is an overheat shutoff. 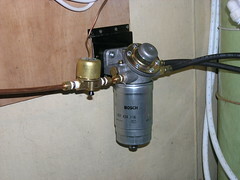 It is connected to a sensor which is positioned above the boiler. In the event of a fire, it will shut off the diesel supply to the boiler. The last piece to go in is, of course, the flue. I just could not wait, and so briefly fired up the system without the flue. To my amazement, and delight, the burner worked just fine first time. I could not run it for long as, even though well ventilated, the engine room was filling up with fumes. Obviously this is now a big motivation to get that flue in and sealed. My first radiator is now plumbed in. You can see work in progress in the picture. I'll leave plumbing in the other radiators for wet days, as this one is enough to test the rest of the system. I'm just conscious of how many sunny days have been lost to installing this central heating and hot water system. For hot showers on board and the comfort of a warm, dry boat I'm convinced this time spent, at the expense of working on painting the hull, is worthwhile though. So I've spent a fair old while fussing with my battery bank just recently. What prompted this has been the new central heating system. It turns out that the central heating system will only run off of a pure sine wave inverter, not just any old inverter. 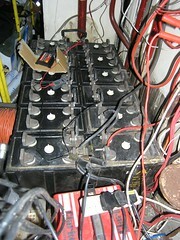 Inverters convert battery power, in my case 24V DC, into mains electric power, 230 V AC here in the UK. My current inverter is a pseudo sine wave inverter. So called because the power it produces is not exactly the same as mains electrify, rather a rough version which is good enough for most electrical devices. They are also cheaper than pure sine inverters. Anyway, I had to splash out on a new pure sine inverter, so turned to Sterling Power who have done me proud in the past. While on Sterling Power's web site I also stumbled across their Battery Refresher, which sounded just the ticket for my poor old battery bank. The battery refresher apparently rejuvenates batteries by removing the sulphate build up on battery plates. This build up is the reason batteries no longer hold their charge, which is exactly the problem I believe have. My time was spent on giving the battery bank a good clean, and pumping charge into the batteries so the battery refresher could work, as it needs 12.8V to run. Something the batteries can only do with the aid of plenty of wind, or the generator, at the moment as they don't hold their charge. I am hoping this de-sulphation unit will resolve this issue. I know I need a second unit for my 24V battery bank, but my empty wallet dictates at present. I'm also lusting after a power management panel and a 230 volt crossover switch from Sterling, as they sound just the job for a quality boat such as Lady Jane. So the welder I extracted from the depths of the engine room, to make room for the central heating system, has finally gone. For the princely sum of £10.00 (US$ 20.00 or so). Good luck to the guy who bought it, then drove five hours down to Southampton from North Wales to fetch it. Apparently it's destined for Zambia, Africa. I really hope he gets it running without too much trouble. The guy did promise to let me know, so if I get any news I'll pass it on. I had the pleasure of welcoming Andrew Tognola, from the Strathspey II, on board Lady Jane on Saturday. Andrew arrived just in time to miss a rather impressive parade of launches, such as the ones you see in the picture, making their way up the River Itchen. After the obligatory tour, we spent a while comparing notes on our various projects. It is obvious that, although we have many common problems, Andrew has some very different challenges to me. Update: It looks like the motor yachts in the picture may have been from a Rampart Owners Club outing. An email from Tony, who I met when I was in St Anthony, Newfoundland, Canada, prompted me to write this rather belated post on St Anthony and Newfoundland. Tony had sent me this picture of a retired water bomber which has recently arrived in St Anthony, seen just down the road from his house. Also note the cruise ship lurking in the background there. Newfoundland is a unique place, the half hour timezone difference to the rest of the eastern seaboard gives a clue here, and one which I certainly look forward to visiting again. Maybe next visit I'll also be able to make it to Labrador as well. The one thing that really stood out for me was the concept of the crown lands there. It seems that the local residents are entitled to arbitrarily put in vegetable gardens along the side of the road, in what is crown land, so as to grow their own vegetables. Potatoes being the most common. Apparently the soil is best along the side of the road, as it accumulates there. The gardens are denoted by rough fences, which are constructed to keep the moose out as they graze on the vegetation gowning on that same rich roadside soil. Moose are a real hazard for drivers at night in this part of the world. The gardens are interspersed with log piles as apparently locals can also cut wood for their personal needs from the surrounding countryside that is crown land. I was also told how, for a small application fee, residents can be granted space to build themselves a log cabin in the woods. Except for the harsh, cold, winters where even the sea freezes over, this sounds almost idyllic. 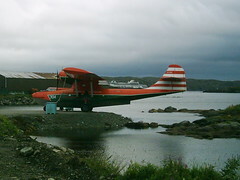 There is, of course, much more to St Anthony and Newfoundland. For example, I always find myself thinking of the early explorers and the like when visiting such remote places. Wilfred Grenfell is just one of these characters who is famous in those parts. 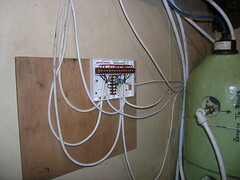 So that's the wiring for the heating system and it's various sensors and controls all connected up. Andy, before you have a heart attack, I promise I'll label them all and tidy the cables up with the new cable ties I just bought (I then almost immediately found the missing cable ties I already had). The wiring has proved to be relatively straightforward, with that 'pre programmed' junction box making life a lot easier than it otherwise could have been. I must say I've blindly followed the directions, and have not yet taken the time to sit down and logically work through how the whole lot works for myself. Though I may never get round to doing that. I've not switched the system on yet, wanting to get the diesel piping connected and at least the first radiator dressed and plumbed in first. I so love just sitting on deck, chilling out and watching life go by. Occasionaly a boat goes by that really stands out from the crowd. 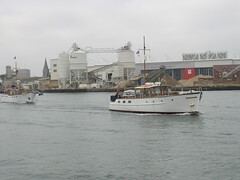 This yacht is just one such example. Something really special, and obviously either very well cared for or brand new. The photo does not really do it justice, as that wooden hull simply gleams. So I knew I had to install a radiator in the space above the engine room, by the shower room, what I had not thought through was just how I would do it. Before starting this phase of the boat central heating installation, I had that all too familiar dawning realisation that things were not going to be all that straightforward. I first had to put in battens and insulation, covered by plywood and then painted before I could finally mount the radiator. No point in just hanging the radiator on an un-insulated outside wall is there? I know me. If I don't do a job properly the first time, it will be forever before it finally does get done. If ever. 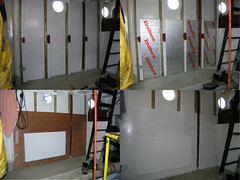 Obviously there is more insulation and panelling to go in, but that can be done later.